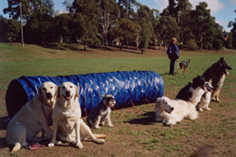 Eastern Suburbs Obedience Dog Club Inc offers an extensive range of dog training activities. These start from basic dog socialisation and basic obedience so that the family pet can be a socially accepted companion in public. A higher level of training is available (and encouraged) so that the dog and owner can participate in obedience trials. Instruction is given for Community Companion Dog - CCD, Companion Dog - CD, Companion Dog Excellent - CDX and Utility Dog - UD standards. 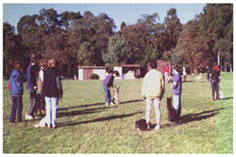 The club hosts one open obedience trial each year. We also have a long history with tracking and hold a tracking trial each year. The club has also demostrated at a number of public gatherings to promote responsible dog ownership in the community. The level to which one can rise in dog obedience is largely governed by the enthusiasm of the owner. Having a well trained dog is a joy for all members of the family. Training at our club is by gentle encouragement and reward. Catching the dog doing something right and then reinforcing that behaviour produces a well behaved canine who is happy, loving and loyal.